Should People Lose The Right to Vote When They Get the Pension? When our democracies were set up, there was one thing that was never anticipated: medical advances leading to a white-haired horde of pensioners that held the balance of power in almost every single election. We’re essentially living in a gerontocracy now, and there’s no giant ice floe to push them out onto. This article looks at a potential compromise for our society. Life expectancy in New Zealand was about 71 years in 1960, which meant that the average person was only expected to live a handful of years once they went on the pension at age 65. When the pension was brought in, in 1898, it was obviously much less than even this. Life expectancy was over 81 years in 2015, and it keeps climbing as medical advances and social changes like the decline in tobacco smoking prevent what had until recently been incurable diseases. This has led to a problem arising: New Zealand now spends over $12,000,000,000 per year on pension payments, as the average person now lives a dozen years or more extra past the pension age, which has not increased. The reason why the age of 65 was usually chosen as the age of universal pension was that, by age 65, a person’s body is usually no longer capable of the physical labour necessary to earn a full wage. The wear and tear of life as a working man meant that a full effort was no longer possible from age 65 and, because the vast majority of jobs going around were working-class ones, it was a reliable rule of thumb that most people would be knackered by then. But if we now live in a knowledge economy, as many politicians and economists are now insisting we do, then the original reason for setting the pension age at 65 is null and void. If we live in an economy where a person’s productivity is primarily a function of their intellectual capabilities then there’s no reason to have a pension age determined by the limitations of the physical body, because there is no need to treat mentally productive people as infirm. It might be that a person’s intellectual capabilities are not enough to keep them in employment either. Perhaps that person traded on the strength of their body and, for whatever reason, their mind was not developed to the point where participation in a knowledge economy was possible. Such a person should still have the right to a pension. But the unfairness arises when a person who is still more than capable of earning a living from their mind does so, at the same time as pocketing a $370 a week pension that was intended specifically for people incapable of working. Winston Peters has shown that even a career as intellectually demanding as top-level politics can be undertaken until one’s mid-70s, and yet if he retires in 2020 he will have claimed the pension for ten years while still working full time. This is really a gigantic con game, in which the elderly have forced payment for their unsustainably lavish lifestyles on the young. Worse, the larger this 65+ age bracket grows, the ever more incentivised they are to vote against any reform to this Ponzi scheme. Democracy was never intended to have this massive bulk of old voters gumming it up. Once a person is at this stage, they have relatively little stake left in the future running of the country. No major decisions need be taken by such people – they’re already sorted. Perhaps our old people need to have a deal put to them? If you reach 65 and feel that you are no longer intellectually capable of participating in the knowledge economy, that’s fine. Here’s a pension – but you are no longer considered intellectually capable of participating in representative democracy. If you want to keep working on the grounds that you’re entirely capable of it still, you can – and you get to vote as well. But you don’t get to claim a pension on the grounds that you’re too infirm to participate and still get to wield power over others. We can accept that, for some people, the fair price to pay for being looked after until death is to forfeit their right to further influence the political system in their favour. After all, if you have a political class that pays you $370 a week no questions asked, when you almost certainly own your own home already and don’t have to pay rent out of it, you’re already creaming it by any measure. Life is sweet and easy at that point. It’s time to stop the Baby Boomers’ theft of the production of the following generations. Taking the right to vote away from pensioners will make it possible for a fairer balance of taxation and benefits to be struck. And how old might you be, author? Still fresh and green, I’ll assume ? 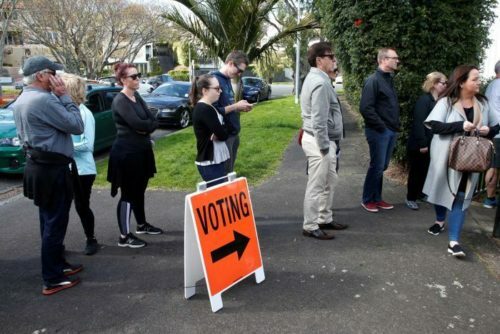 Are you thinking of ‘means testing’ for electoral privilege …. some kind of SAT for suitability to make these weighty decisions at the voting booth? Or are you publishing this stew of arrant garbage just to be ‘edgy’ and contentious … ? No. I’d think you may just be this stupid. You may just qualify as a snowflake – some entitled yuppie wanker who feels the small amount of intellect you inherited from better adults allows you to pontificate on this. Who values what you think ? You disqualify yourself from analytical thinking by the very nature of this post – the lack of substance in an search for blog controversy. I totally agree with you, Henry Balfour. What this arrogant young numbnuts fails to understand is, that with years comes WISDOM. Something this entitled liberal may, but not for sure, learn one day way into the future. Also ignored is that the taxes paid and inventions created by the ‘older’ generation, is what makes their standard and comfort and excitement of living possible today! So, WE, at least, have EARNED our right to vote, using the WISDOM, LIFE EXPERIENCE and KNOWLEDGE that we have acquired, and of which you have no clue. Better to let people think that you are stupid & arrogant, rather than blurt out rubbish just to prove it! What a load of garbage, who ever you are you most probably would not be here if it was not for the very people you are talking about. The Baby Boomers as you call us built New Zealand to what it is today, we worked hard as well as saved for our retirement not like the younger generation who spend everything and continually moan about how poor they are. Try starting work for $9.00 per week (yes per week) take home pay and then you will know what hardship really is. It was us old folks that fought and died for your democracy for without us and the generation before us you would be speaking German or Japanese and have no democratic rights. If you cannot acknowledge the contribution we older people made and are still making I suggest you go overseas and see if you can find something better. Inspired choice to post this to New Zealand Centre for Political Research. You will be able to crystallise that “worked all our lives” argument and demolish it in one hit at the end. I think you are quite right, I just want to know were the $370 a week came from, last time I looked it was $300. I will say that one year in the ’70s, I paid the equivalent of $400.000 in tax in todays terms. I will never get back what I have paid in that one year so, (most of it has gone in treaty settlements I would think) by the sound of you, you wouldnt have the nous to be able to make that much money, probably too busy talking on your cell phone and checking Tinder to see if you have any takers. I have paid my dues, I hope you have paid enough tax to cover you health and pension needs, or are even bright enough to have made enough money to not need a pension. God knows how many lawyers and journalists like you I have helped put through university, scabs the lot of them…. This is seriously very wrongheaded and contravenes the principles of a democracy from the outset. Policing ‘old people’ by taking their right to vote away from them is just silly. There really is no other word for it. Whether or not you get a pension is irrelevant to your right to vote, and so is your age (after 18). Not all ‘baby boomers’ should be placed in the same basket. There are many elderly people who are suffering terribly under a neoliberal regime that is punitive and isolating. Those who are not ‘working for a wage’ because of age should not be isolated any further by then telling them they are not part of society. Suggesting that old people are a ‘white haired horde’ and lamenting that there is no ‘ice floe’ to push them out onto is kind of patronising and derogatory. The tag words for this article are ‘justice’ ‘democracy’ ‘politics’. Well, from where I am sitting , this tirade is nothing more than an uninformed rant that is based on profound injustice toward elderly people, it is politically naive and contravenes the tenets of a democracy. Previous Previous post: Are the Black Caps Really a Better Test Side than the Baggy Greens?